This work was completed on 22 December 1849, about four years after Schumann had noted in his diary that it would be a good idea to arrange poems for narration with piano. The poem comes from Hebbel’s Gedichte of 1842, a volume that we know Schumann had to hand in 1849 because it contains the poem ‘Quellende, schwellende Nacht’ which Schumann set as Nachtlied for chorus and orchestra, Op 108. Wiegenlied Op 78 No 4 (‘Schlaf, Kindlein, schlaf!’) and Das Glück Op 79 No 16, both Hebbel duets that were composed in 1849, are in the same collection. Schumann sometimes put his works to one side after completing them, as if laying them down in a wine cellar, particularly if he was uncertain of their worth. He came back to Schön Hedwig three years later, at the end of 1852, and offered it for publication to the firm of Kistner. The manuscript was returned from there with some embarrassment, but it was welcomed by the publisher Barthold Senff who seemed keen as mustard: ‘the piece interests me very much, it is something completely new, and I hope we will pleasantly surprise the musical world’. It appeared as Op 106 in May 1853. Schumann sent a copy to Hebbel who seemed well pleased with ‘a kind of composition that does not yet exist’. The poem has twelve strophes, but the concision of the words ensures that the action is swift and decisive, even if the majority of the poem comprises the intimate but public interrogation of Hedwig by her lord. 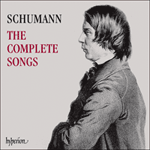 Schumann frames the poem with a long piano prelude of twenty-four bars that seems an overture of sort, the curtain rising on a medieval dining hall where a Ritter (surely more of a king than a knight) is surrounded by his entourage. The entry of Hedwig whose lowly duty it is to fill the wine goblets is accompanied by an oboe-like theme, demurely feminine in contrast to the pianistic testosterone of the opening. The long conversation between the knight and the beautiful maiden who has caught his eye occasions fragments of music indicative of Hedwig’s modesty, and the knight’s determination—the latter music derives from the opening motif that recalls the rising sixths of hunting horns. When he asks her outright whether she loves him the narrator’s voice is accompanied by solemn yet lyrical music in crotchets and minims—the legato a respite from the aggressive mood of the opening. When Hedwig eventually admits in public to loving her master there is no other course for her (she believes) than that she should enter a nunnery. It takes less than a page of music to allow the knight to sweep the astonished girl away on his arm to marry her straightaway in the chapel. There is a brief return to the music of the opening for a ‘happily ever after’ ending. Hebbel’s poem dates from 1838. It was written partly in protest at Griseldis, a play in blank verse by Friedrich Halm that enjoyed huge success in Vienna in 1835. The action of Griseldis is set in Arthurian England; the eponymous heroine leaves her husband Sir Perceval when she discovers that the trials that she has undergone have been cruelly unnecessary. This theme of independent ‘womanhood in conflict with itself’, an elaboration of Kleists’s Käthchen von Heilbronn, was repugnant to Hebbel. In Schön Hedwig a gallant knight of yore chooses his fair lady and marries her forthwith. In Hebbel’s poem beautiful Hedwig is an illegitimate foundling (who has ‘come from God’); it is within the power of the knight to respond quixotically to his instincts concerning her goodness, and to sweep the shame of her birth aside, elevating her to the highest rank in the land. Paternalistic certainly, but Hedwig is no princess in disguise to preserve the status quo. The poet’s conservatism had nothing to do with the social niceties of the time. In fact, when he wrote this poem he was living in Hamburg with a devoted seamstress, Elise Lensing, with whom he had children out of wedlock, though they died in infancy. Longtemps avant que Liszt s’aventure dans le genre du mélodrame, Schumann, toujours inventif, mêle ici le mot parlé à l’accompagnement pianistique. Le seul exercice de Schubert dans le genre n’a été publié qu’en 1872 et Schumann n’a pas pu le connaître. Schumann avait mis en musique de petits poèmes de Hebbel dans les op. 27, 78 et 79, mais le grand auteur dramatique, qui résidait à Vienne, avait participé au livret de l’opéra de Schumann Genoveva, et le compositeur a visiblement apprécié l’idée de mettre en musique un poème plus important de Hebbel. En 1849, il a également composé le Nachtlied, op. 108, pour chœur et orchestre sur un texte de Hebbel. Hier kombiniert der stets erfinderische Schumann lange vor Liszts Ausflügen ins Melodrama das gesprochene Wort mit Klavierbegleitung. Schuberts vereinzelte Übung in diesem Genre wurde erst 1872 veröffentlicht und konnte Schumann nicht bekannt sein. Er hatte einige kleine Hebbel-Gedichte zu Musik in opp. 27, 78 und 79 gesetzt, doch der in Wien lebende große Bühnenschriftsteller hatte seinen Anteil am Libretto zu Schumanns Oper Genoveva geleistet, und Schumann war deutlich geneigt, ein größeres Gedicht von Hebbel zu vertonen. 1849 komponierte er außerdem das Nachtlied op. 108 für Chor und Orchester zu einem Hebbeltext. Und füllt ihm den Pokal. Die Welt ist gar zu weit. Was tauscht’ ich eitel Ort um Ort? Warum ich folg’, wohin du winkst? Ei, sprich, wie könnt’ ich ruhn? Und möcht’ es ewig tun! Und spricht: Ich liebe dich! Ziemt nur der Schleier mir! So fühl’ ich, das ist wahr. Noch heut dich zum Altar. And his cheeks are glowing. And fills his goblet with wine. Why do you always follow me? About my father and mother. The world is far too vast. Is full of joy and splendour. Why do I follow your every sign? Ah! how could I ever stay put? And would like to do it forever! And answers: I love you! The veil alone becomes me! I feel that you speak the truth. To the altar this very day!